« (baby)FishStix Product Review & Giveaway! I recently received this John Deere Pillowcase dress from StrollerblanketMom. It is so sweet with those cute pink ribbons! Pictured here is my 3 year old, Lenna, twirling in her new dress. She loves it! It is a simple, lightweight and perfectly sewn dress. 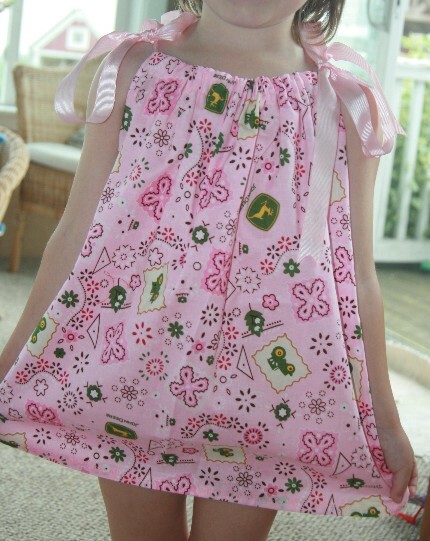 StrollerblanketMom is owned by seasoned seamstress, Annette. She owns a wonderful online shop featuring her handmade gifts…you name it: shoes, blankets, dresses, diaper covers, onesies, jumpers, changing pads, washcloths, hair scrunchies, crocheted headbands…the list goes on. StrollerblanketMom also welcomes custom orders and embroidery. In June she is offering free shipping on all ready to ship items. Please check out her shop HERE for more information. 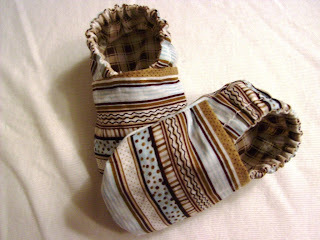 StrollerblanketMom is giving away your choice of shoes below to one of my readers. These are adorable! They come in sizes 0-3, 3-6 or 6-12 months. Congrats to Mary Ellen for the Win! Giveaway Ends: Monday, June 21 @ 1:00p.m. Leave a comment to be entered twice! 2 comments to StrollerBlanketMom Review & Weekend Giveaway!